Working on a rare commission this weekend. I loves how she came out. 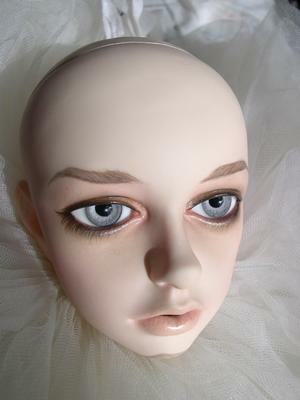 She’s a Dollstown Estella, she still needs eyelashes. Fun! If it doesn’t rain tonight I can do the body blushing tomorrow. Thanks so much to everyone for kitty wishes! Zman is doing really well. She’s more sprightly than she’s been a long while. I think the pain reliever is helping with her arthritic hips and she’s been dashing about in small spurts. Amazing! Went to see Kamikaze Girls at the Lumiere this afternoon. BEST GIRL MOVIE EVER. Totally loved it. For real. Rawr. Also ran into fellow LJ buddy Pekochan in the lobby! We’d never met but she recognized me and said “hi” and we all had really nice chats in the lobby. But our meter ran out so we had to go… went to Japan Town for miso ramen and sashimi and spicy tuna handrolls, omg. YUM. Bought more dolly books, duh. You are such an artist. Have fun with her body!!! She’s so pretty! Thank you, Kallisti! Previous Previous post: Volks really ♥ us! Next Next post: Happy Hallows!